Veneers and lumineers boast unsurpassed aesthetic characteristics. It is possible to select any tooth color, while reproducing individual peculiarities with a minimum thickness. The high permissible load ensures their durability. What are the benefits of veneer restoration? How much does it cost to install veneers? Important notice! The iStomatolog center carefully monitors the quality of materials at each stage of veneers (lumineers) manufacturing. This is very important, as there are a lot of poor quality counterfeits in the market. In iStomatolog, the veneers are manufactured only using a laboratory-based method. We offer installation of veneers (lumineers) from a world-known manufacturer in the field of dental materials – the IPS e.max Press system by Ivoclar. Veneer restoration without tooth surface processing, so-called Hollywood veneers, is also available. Veneers feature a minimal thickness, while granting the opportunity to choose the color and shape at patient’s option. The E.Max veneers don’t change their color over time, they aren’t prone to coloring with food pigments and to abrasion when chewing. Due to the perfect marginal fit to the tooth surface, the risk of gum inflammation is eliminated. 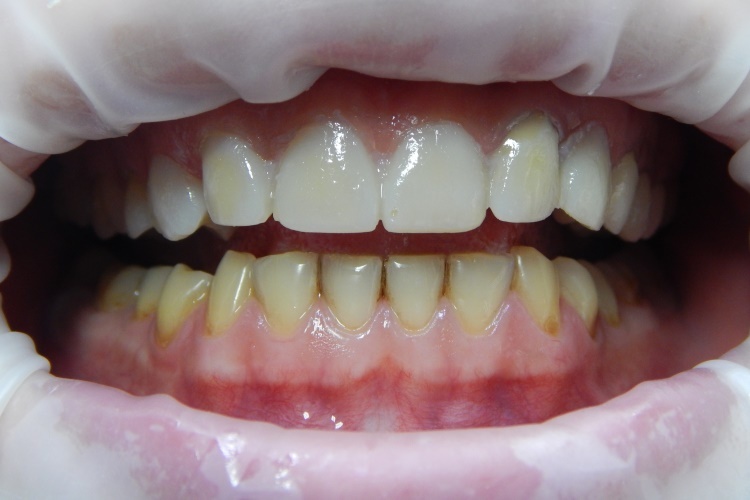 This is the optimal aesthetics and functionality ratio in tooth restoration. How Are Veneers Installed in iStomatolog? Discussing the desired changes with a patient: a tooth color and shape, a number of teeth to be covered with veneers, possible additional treatment or alternative methods (for example, composite restoration or so-called "directly placed veneers"). Taking preliminary tooth impressions for making the mould. Filling it with a wax, a dental technician perfects the desired teeth shape, size and position in the dental arcade. This is called a diagnostic wax-up. With its help the patient can clearly understand what his new smile will look like to correct the details, if necessary. And only after the approval, a dentist starts tooth preparation. Tooth preparation, taking tooth impressions for E.max veneers manufacturing and manufacturing of temporary plastic veneers, which are fixed on the tooth surface with a special cement adgesive. Try-in and installation of E.max veneers. unnatural tooth color, shape and size. The average cost of one veneer per tooth is 5100 UAH. Make an appointment for a free consultation at the iStomatolog family dentistry center to find out which of aesthetic tooth restoration (veneers, lumineers, composite restoration) is indicated in your case given all individual peculiarities, as well as treatment duration and number of teeth to be restored to get the expected result. Veneer restoration requires a thorough and well-coordinated team work of a patient, dentist and dental technician. The amount of time spent depends primarily on the initial teeth condition (discoloring, shape, position in the dental arcade, carious lesions, etc.) and on the desired result.